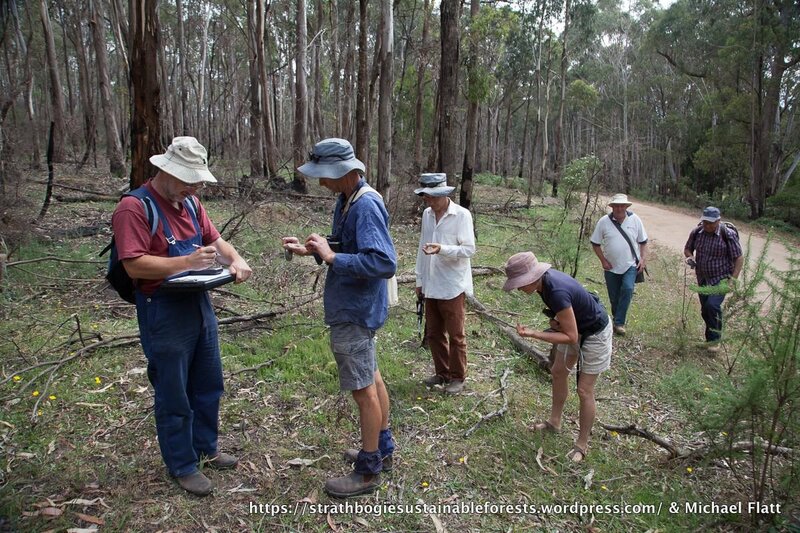 Survey group checking location and calibrating instruments at the start of a transect survey. The results of our initial survey, last November, of DELWP’s Tames Rd planned-burn were alarming! So much so that we decided to survey a different part of the planned-burn in order to increase the area surveyed, the number of trees measured and improve the robustness of the survey overall. Two additional 50 m-wide transects (total 1000 m long) were surveyed on Dec. 6th last year, bearing west off Dry Creek Rd; Transects 3 and 4 on the map below. 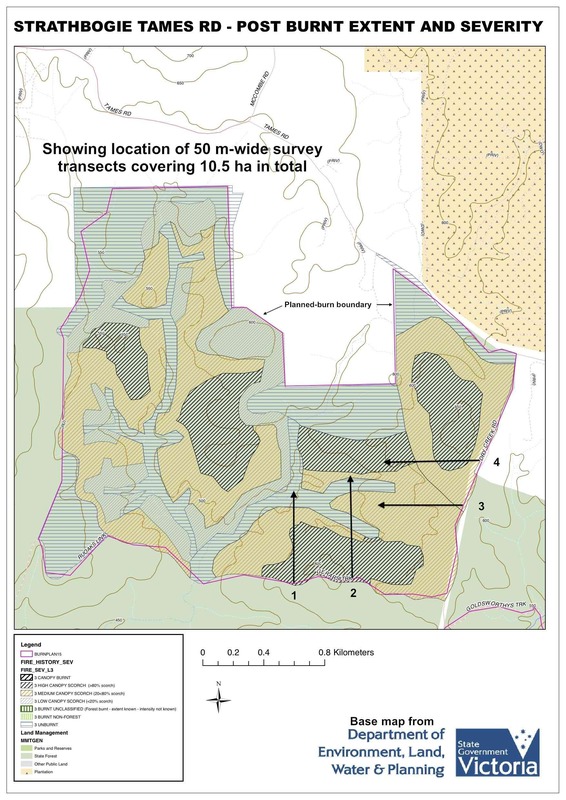 Annotated map of DELWP’s assessment of the impact of the planned-burn on the forest. Click to enlarge. Burnt, or not burnt by the planned-burn. 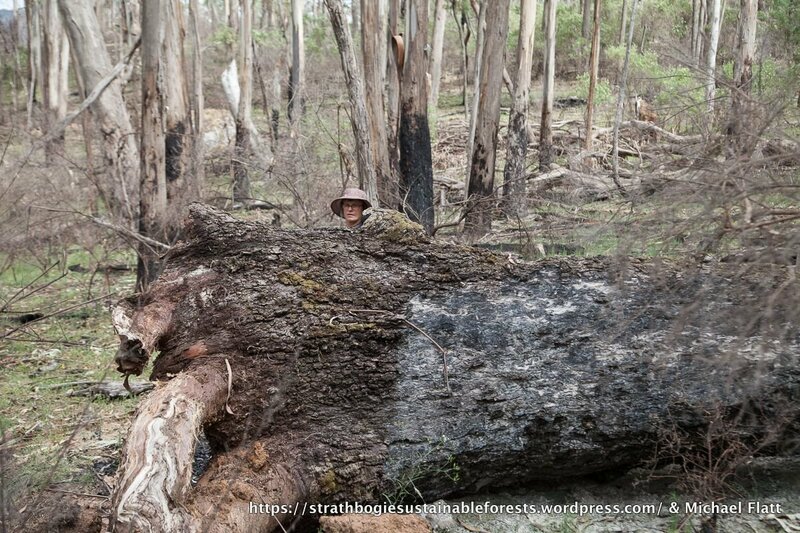 This category included all trees that showed signs of being burnt by the planned-burn. 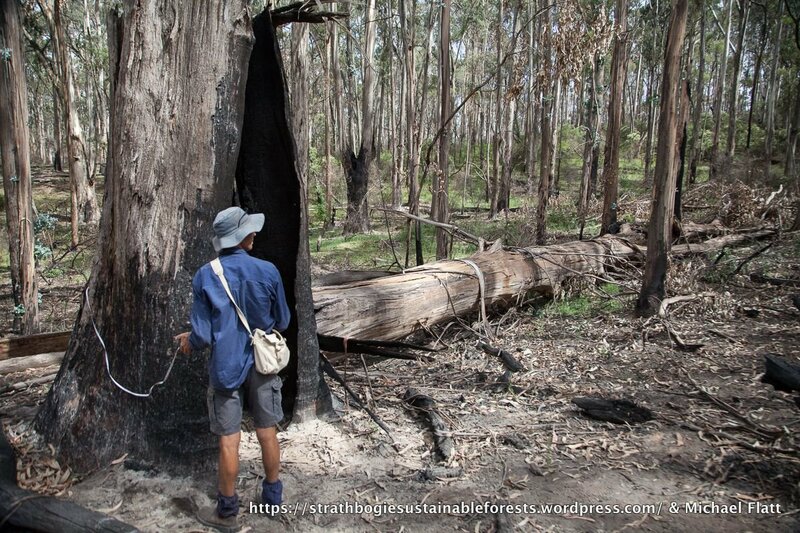 If any part of a tree was at all visibly burnt by the burn is was categorized as ‘burnt’. Living, or dead at time of burn. 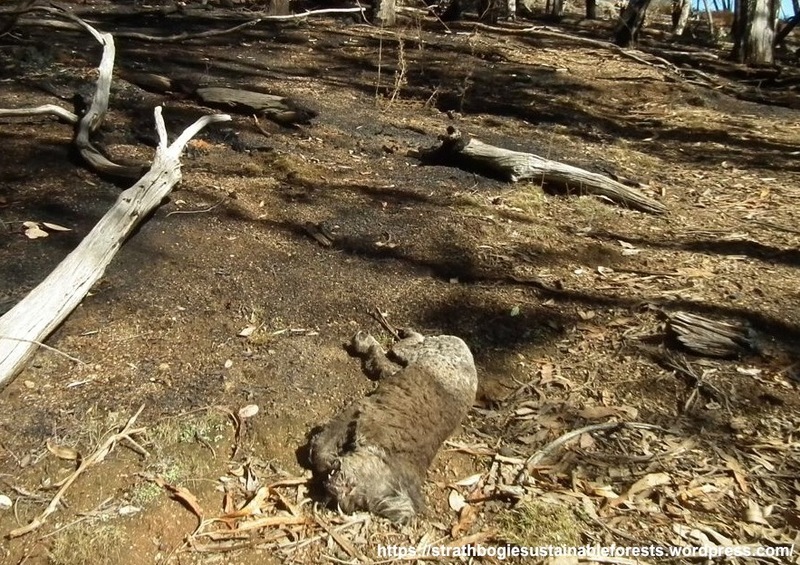 It was important to determine the impact of the planned-burn on forest stags (dead, standing trees), so all dead trees (standing and fallen) were inspected to determine whether they were dead or alive before the burn and whether the burn felled them, or whether they had fallen before the burn. 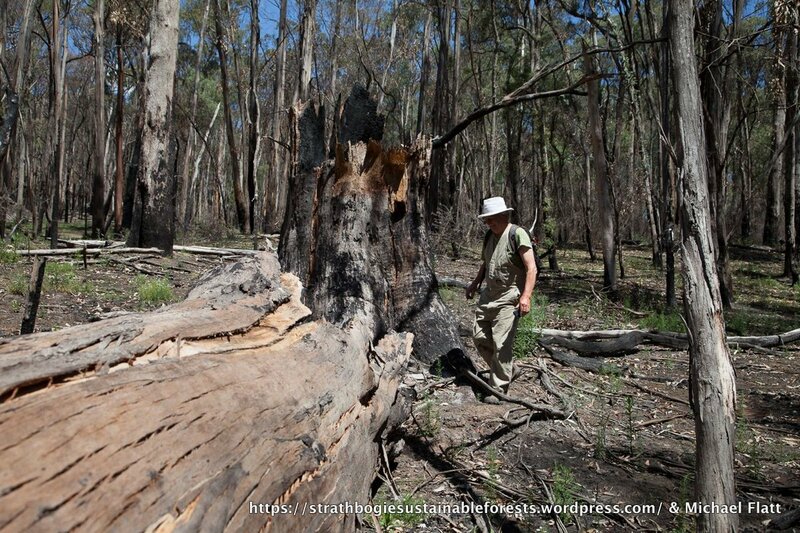 Where doubt arose, burnt, fallen trees were excluded from the survey. Killed, or not killed by burn. If a tree showed signs of life (green leaves) it was regarded as ‘living’, even if it’s health appeared compromised by being fire affected. 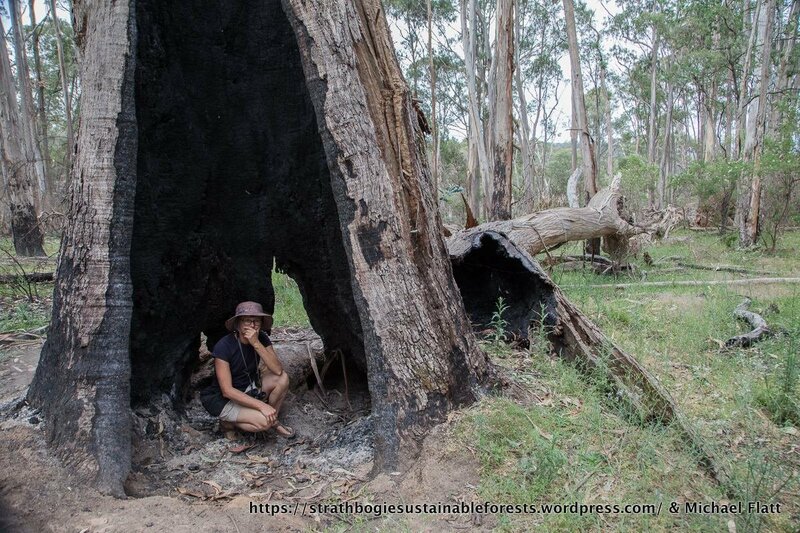 These categories allowed us to assess the impact of the planned-burn on both living trees and stags (standing, dead trees) in the forest and across two size classes – 70-99.9 cm dbh and >100 cm dbh. This time around we measured 151 trees and stags (compared to 122 in Transects 3 & 4).